Thanks for your candor over the start of your month. A sad start for your holiday season. So glad that you had your son, husband and his family to make your holiday a bit better. So glad to read your posts and see your beautiful art work again. Hi Joan, your card is beautiful. I am so sorry that it has been such a rough year for you, but also glad that this holiday seems to be bringing your spirits back. Merry Christmas & HUGS! Joan, I am sorry to read of the sorrow you have endured this year. I hope 2014 is kinder to you . I Love the card ! Oh, Joan, sorry to hear of your loss. So glad that you (and husband & son) were able to enjoy Christmas with your husband's family. A little jealous you have a sister-in-law who cooks (0 for 2 on that count here!). May 2014 bring you peace and joy. Joan, here's to a 2014 full of peace for you. You and another online friend who lost a loved one recently both appear to have found some peace in the joy of family and friends this Christmas. It takes your being open to the love poured out by others to achieve that. I'm so very blown away by the strength you both have shown and wish I could be there to give you a hug. The card is beautiful! 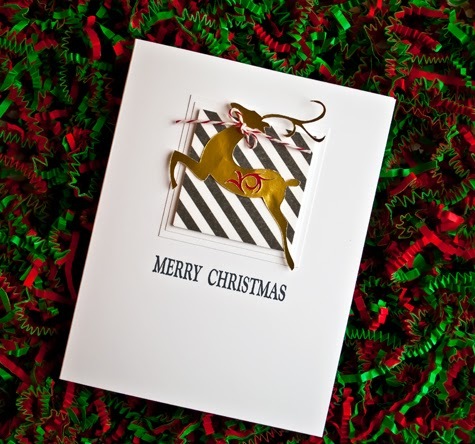 The delicacy of the reindeer is offset by the boldness of the gold paper and strong diagonal lines. Perfect! Beautiful card, Joan. So sorry for the loss of your brother and the fact that you are the last of your small family. I'm very happy for you that you have a wonderful husband with a wonderful family to share with you. Have an awesome 2014. Your cards this past week have been simply stunning! My deepest sympathies to you on the loss of your brother. Remember, in your current immediate family, you still have your wonderful husband and son who love you dearly. I'm glad your Christmas was joyous. Joan, what a lot you have been through this year. I do feel for you. I am so glad your family Christmas brought you joy. My parents have been through a tough time of late; for some of it I was able to be with them and give them assistance. Leaving them was very difficult but I found my husband and children to be a great buffer against the sadness. Sympathies to you in your loss of your brother, Joan. Glad you've been finding some beauty and happiness in paper, stamps, and color - and in family. Thanks for sharing your cards and your stories with us. Wishing you peace, love, and joy in 2014.
and I am sorry to hear of your loss.